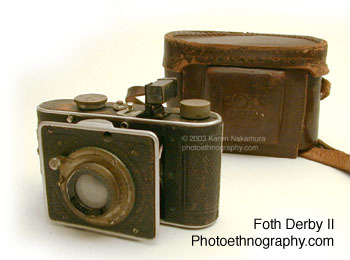 The Foth Derby II is small folding 127 format scale-focusing camera produced by the C.F. Foth & Company from 1931-1936. It is a variant of the Derby I with a self-timer (the red crank visible in the photos of the top). It is an extremely simple camera with scale focusing, a basic optical telescopic viewfinder, and rear window type film counter. The shutter is a horizontal travel cloth focal plane shutter with speeds from 1/25 to 1/300. The lens is a simple Anastigmat 50mm f/2.5, quite bright for its day, but uncoated. The shutter button is hidden. If you are looking at the camera from the front (as below) it's on the front of the body at the 10 o'clock position, and is revealed when the camera is opened. According to McKeowns, there are two cameras with the Derby II moniker. 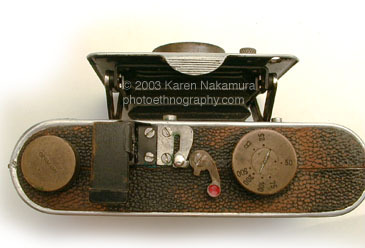 The one pictured here is the earlier one, the self-timer variant of the Derby II. 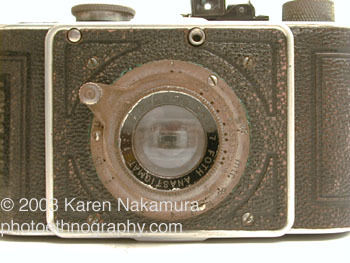 Then there is the later Derb II (1934-42) which has a rangefinder and a focal plane shutter that goes up to 1/500 sec. Interestingly, you can get this camera with a Leitz Elmar lens, which is a much rarer and more expensive version. I had my repair shop fix it up (Oleg put in a new shutter curtain) and now it's one of my more amusing display cameras. Oleg did a really fantastic job with the repair. It's really not that useful as 127 film isn't that easy to get. C.F. Foth & Company was a camera maker in Berlin, Germany that produced a series of small folding 127 & 120 format rollfilm cameras. They did not survive the war. Last modified: Friday, 07-Jan-2011 15:17:01 EST , [an error occurred while processing this directive] .